The Midwest’s biggest digital business conference? Check. Great networking and learning for professionals? Check. Among the 15 presentations given at FutureMidwest 2011 recently, two specific individuals made an impression on my favorite aspect of PR: writing a pitch. Josh Linker, a New York Times bestselling author and founder, chairman and former CEO of ePrize, presented on creativity and how much originality matters. (Disclosure: ePrize is an Airfoil client.) Meanwhile, David Leider, CEO and board member of Gas Station TV, presented on being aggressive, being bold and, most importantly, not getting caught up in worrying about what others think. Their content and style of their presentations brought to mind some similarities for public relations professionals who are working to gain the attention of media for clients. When writing a pitch, 1. 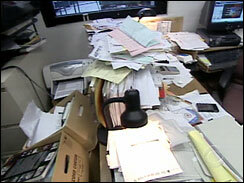 The reporter’s office/email inbox probably looks something like this and 2. What can possibly be said to get through all of that clutter? 1. Short and sweet makes a reporter want to meet. I know, I know. There’s so much interesting information that you want to include, but by the time you’re done, you have the makings for the next War and Peace. Try keeping your pitch to no more than three paragraphs, and remember that bullet points can be your best friend. Leider’s presentation was right before lunch, which for some could cause the audience’s focus to waver. However, Leider’s short but effective presentation had the audience engaged from start to finish, while getting across his point that being bold and aggressive is key in marketing. 2. Put your reporter hat on. When you’re writing your pitch, ask yourself, “Why should this reporter give my client, or its product, coverage?” By doing this, your mindset is focused on what story angles the reporter could use. When you have your answer, you also have your pitch. Leider showed different creative campaigns that Gas Station TV had used to get the attention of prospective clients. By putting itself in the mindset of its preferred demographic, the GSTV team was able to market effectively, just like PR should with a reporter. This tip may seem to be too time consuming when pitching a large amount of media outlets, but it doesn’t have to be. Although you’re trying to relate to dozens of reporters, all of whom have different interests, backgrounds, etc., you can always find a neutral ground to tell your story, such as work, family, traveling, etc. When discussing how socks can easily be lost or not match, something that everyone can relate to, Linker mentioned Arielle Eckstut’s company, Little MissMatched. Eckstut’s creative idea, selling pairs of socks in threes and fives and not matching, is now a multi-million dollar company. Although it’s a huge success, what makes the story great for a presenter is how it covers such a wide range of listeners. When following up with a reporter, choose the “Reply to All” option. Not only will this help remind the reporter what your initial pitch was, but it also shows conversation. Sneaky? Maybe. Does it get the reporter’s attention? Usually. Linkner’s overall presentation gave a lot of examples like Eckstut. By showing conversation, you’ve taken a simple idea and found a creative way to use it professionally. 5. Give yourself a voice. Write how you talk. When you come off as being too technical in your writing, you also lose some, if not all of your great personality traits. Both Linkner and Leider used their voices by talking to the crowd instead of reading to them. Of course they were prepared and had slides to present, but they both came across as if they were having a casual one-on-one conversation with you and not reading off of a script. FutureMidwest’s overall theme of originality and creativity is just part of what Airfoil’s Higher Thinking is all about. And if you follow these tips, will you have success more often than not? Check. — Dave Niemiec is an account coordinator at Airfoil Public Relations, a high tech PR agency with offices in Detroit and Silicon Valley.